The snowshoe hare, with its unique ability to change the color of its fur to correspond with the seasons, is excellent at concealment from predators. However, climate change’s affect on temperatures has caused the hare’s transformation to be out of sync. Will this phenological mismatch cause a decline in hare populations? Figure 1. A snowshoe hare hides from predators, but its white fur has not fully changed to brown. Photograph by Peg Becks, 2011, FlickrCommons. CC BY 2.0. Figure 2. A Snowshoe Hare transitions from an entirely white coat to an entirely brown coat between the seasons of winter and summer. Left photo by D. Gordan E. Robertson 2013, Wikimedia Commons. CC BY-SA 3.0. Right photo by Walter Siegmund, 2013, Wikimedia Commons. CC BY-SA 3.0. Studies, like those conducted by Zimova, M., et al. (2014) and Mills, L.S., et al. (2013), have aimed to investigate the phenological mismatch of the snowshoe hare’s coat. For over three years, Zimova and Mills placed radio collars on 148 Montana hares, which allowed the researchers to track and monitor the hares’ whereabouts.4,10 Regrettably, due to the short lifespan of snowshoe hares, only seven of the original 148 survived for more than one molting cycle (new hares took the places of the others as they died).4,10 However, the researchers were able to study these creatures in a time period that “spanned among the shortest and longest snow years in the recent past.”4 This provided them with various backdrops needed to test the new plasticity and mismatch of the hares. The team monitored the snowshoe hares in these different environments during the process of their molts, and calculated the percentages of differentiation between their fur, and the amount of snow covering the ground. Figure 3. 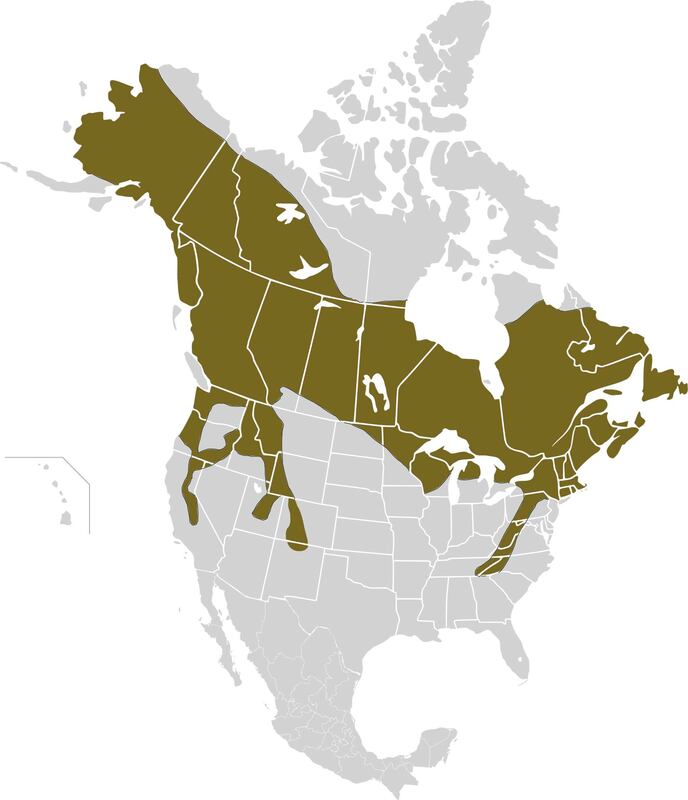 Range map of the Snowshoe Hare. Map by Cephas, 2009, Wikimedia Commons. CC BY-SA 3.0. The decrease in snow cover will only worsen as climate change increases. Luckily the snowshoe hare can adapt quickly to environmental changes.1 This should not be a sole-source solution for the species. Mitigating the effects of climate change will improve the survivability for many species in the northern hemisphere. The continued survival of snowshoe hare should be seen as an opportunity for people to view the costs of climate change on the environment. Figure 4. 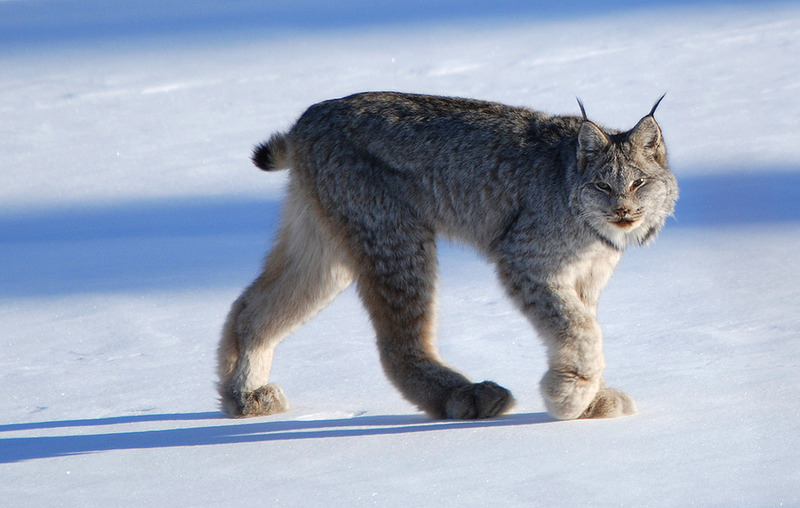 Canada Lynx (Lynx canadensis), a Snowshoe Hare predator. Photograph by Keith Williams, 2010, FlickrCommons. CC BY 2.0. Botero, C.A., et al. (2015). Evolutionary tipping points in the capacity to adapt to environmental change. Proceedings of the National Academy of Sciences of the United States of America, 112(1):184-189. Kielland, K., et al. (2010). Demography of snowshoe hares in relation to regional climate variability during a 10-year population cycle in interior Alaska. Canadian Journal of Forest Research, 40(7):1265-1272. Marris, E. (2014, July 17). Can Snowshoe Hares Evolve To Cope With Climate Change? National Geographic. Retrieved from http://news.nationalgeographic.com/news/2014/07/140717-snowshoe-hares-climate-change-environment-animals-science. Mills, L.S., et al. (2013). Camouflage mismatch in seasonal coat color due to decreased snow duration. Proceedings of the National Academy of Sciences of the United States of America, 110(28):11660-11660. NPR (Producer). (2013, September 8). Climate Change Leaves Hares Wearing The Wrong Colors.Retrieved January 27, 2016, from http://www.npr.org/2013/09/08/220188619/climate-change-leaves-hares-wearing-the-wrong-colors. Stenseth, N.C., et al. (1997). Population regulation in snowshoe hare and Canadian lynx: Asymmetric food web configurations between hare and lynx. Proceedings of the National Academy of Sciences of the United States of America, 94(10):5147-5152. U.S. Geological Survey (Producer). (2013, July 9). Can Camouflage Keep up With Climate Change? White Hares on Brown Snowless Backgrounds as a Model to Study Adaptation to Climate Stress. Retrieved January 28, 2016, from https://nccwsc.usgs.gov/webinar/194. Yan, C., et al. (2013). Linking climate change to population cycles of hares and lynx. Global Change Biology, 19(11):3263-3271. Zielinski, S. (2016, January 26). Climate Change May Be Deadly For Snowshoe Hares. Science News. Retrieved from https://www.sciencenews.org/blog/wild-things/climate-change-may-be-deadly-snowshoe-hares. Zimova, M., et al. (2014). 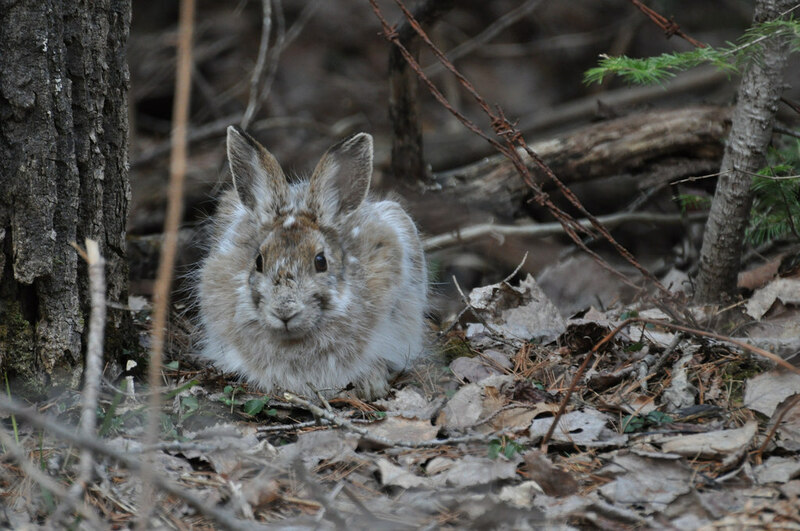 Snowshoe hares display limited phenotypic plasticity to mismatch in seasonal camouflage. Proceedings of the Royal Society B-Biological Sciences, 281(1782). Becks, Peg. (2011). [Photograph of Snowshoe Hare both brown and white coloring]. Retrieved from FlickrCommons. CC BY 2.0. Cephas. (2009). [Range map of snowshoe hare]. Retrieved from Wikimedia Commons. CC BY-SA 3.0. Robertson, D. Gordon E. (2013). [Photograph of Snowshoe Hare white morph]. Retrieved from Wikimedia Commons. CC BY-SA 3.0. Siegmund, Walter. (2013). [Photograph of Snowshoe Hare in brown coloring]. Retrieved from Wikimedia Commons. CC BY-SA 3.0. Williams, Keith. (2010). [Photograph of Canada Lynx]. Retrieved from FlickrCommons. CC BY 2.0.